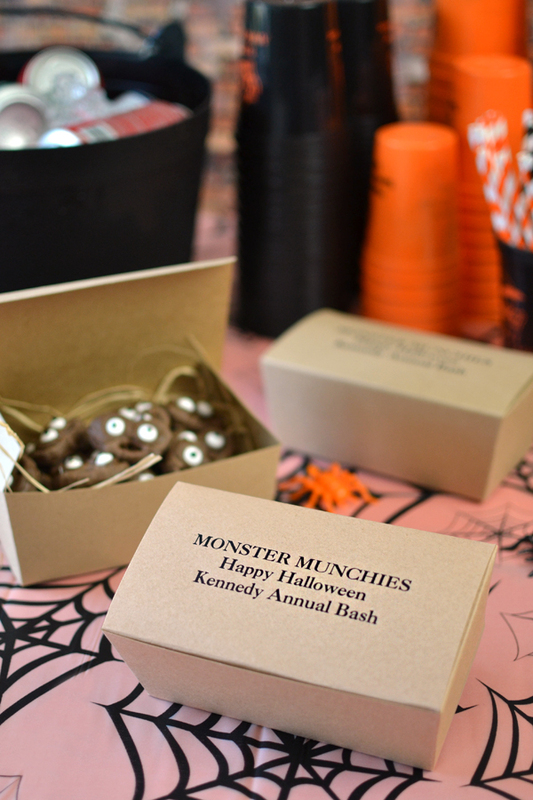 Serve party guests monster munchies in these large 6 x 4 inch Halloween Kraft treat boxes. Great for filling with spooky homemade Halloween desserts and favors as guest souvenirs (contents not included). Personalize your boxes with up to four lines of text or with a festive Halloween design and two lines of text. Each kraft favor box measures 6 3/4 inches wide by 3 3/4 inches deep by 3 1/2 inches tall. Some filler ideas include chocolate covered pretzels, two standard cupcakes, rice krispies treats, brownies, or cookies.